The Very Highest Quality Diamond Ear-Rings. . .
As a pair of single stone diamond ear-rings there is not really alot we can tell you about these as we would hope the picture tells you enough! A second hand item, these ear-rings feature a single diamond claw set in eighteen carat white gold with eighteen carat yellow gold posts. 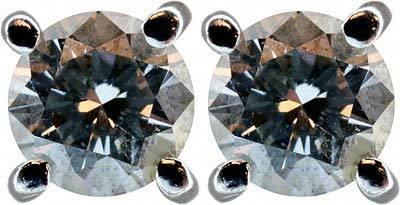 This diamonds weigh 0.59ct in total and we have graded them to be H colour and P2 clarity.